Analysis Even the most subjective Opteron advocates could not have predicted this. Over the past two years, AMD's flashy server chip has arguably affected the fortunes of five major technology companies in ways that extend far beyond market share and revenue swings. If so inclined, you could make a strong case that Opteron and its marketing inertia have turned losers into winners and vice versa at an unprecedented clip. At least, that's what the wisdom of Wall Street seems to be telling us. There's an admitted inanity tied to comparing the recent fortunes of $100bn, $50bn and $15bn companies by looking at a single factor - Opteron. The exercise hurts even more by looking solely at share prices, which shift in sweeping fashion because of a host of factors – both rational and not. Still, there's no denying the evidence that Opteron has divided the hardware world into the haves and have nots over the past two years. Just have a gander at our chart below. A few months back, AMD's share price gains would have been even more dramatic with the company surging well past the other hardware makers in the discussion. That's when Opteron was at its absolute high, stealing market share from an Intel that had no answer to the product. With new Xeons now on sale, Intel has cooled some of the investor ardor for AMD, but the house that Sanders built remains our top performer. 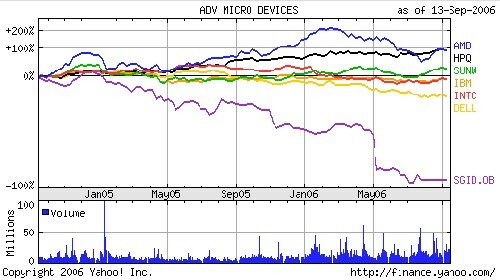 There's no question that Opteron and Opteron alone is responsible for AMD's inflating shares. The company has gone from essentially a non-entity in the x86 server market to a major player – holding about 25 per cent of the segment. Opteron has completely changed AMD's financial state, giving it a cash cow. The two server vendors which embraced Opteron in the biggest way have done well over the past two years as well. HP's share price has skyrocketed over the last 12 months, and Sun has made a strong recent charge on the back of improving server sales. Most people will point to new CEO Mark Hurd as the reason for HP's success. Hurd slashed HP's workforce, lowered costs and managed to churn out consistent results the last couple of quarters. Of course, Hurd's greatest success has been the fact that he's not Carly Fiorina – something investors adore. But lurking behind these factors is AMD's Opteron. HP bought Compaq, in large part, to secure the company's well-regarded ProLiant server line. These systems have sold extremely well since HP packed them full of Opterons and have given HP a major edge over IBM and Dell. Beyond the sales boost, HP gained in investors' and customers' minds by presenting itself as being ahead of the curve and willing to make practical business decisions, even if the decisions meant upsetting a close partner as powerful as Intel. HP used Opteron to convey the message that it would drive a profitable x86 server business by any means necessary. Meanwhile, IBM and Dell looked like laggards, squabbling over marketing perks and emotions rather than going with the best product available. HP's Opteron embrace backed up the pragmatic story Hurd was telling investors and customers. In addition, the continued success of the ProLiant line has helped erase some of the scars left over from the Compaq buy. The factors pushing Sun's gains are complex too, although one can draw a more direct line to Opteron's influence. Over the past four or so years, Sun's shares have tended to oscillate between $3.80 and $5.20 per share, depending on how optimistic investors were about the vendor's turnaround story. Investors would pump Sun up over $5 and then send it tumbling down again following disappointing earnings reports. Following Sun's most recent quarter, however, investors displayed a different pattern. They've stuck with Sun and kept nudging its shares higher. That's because Sun's UltraSPARC business has been healthy, and also because Sun has demonstrated continued growth from its x86 unit. Like HP, Sun bet on the right horse at the right time. And, like AMD, Sun is emerging as a major player in the x86 market after having been a non-entity two years back. That's the haves. Now, let's look at the have-nots. What are these pesky neural networks really looking at?